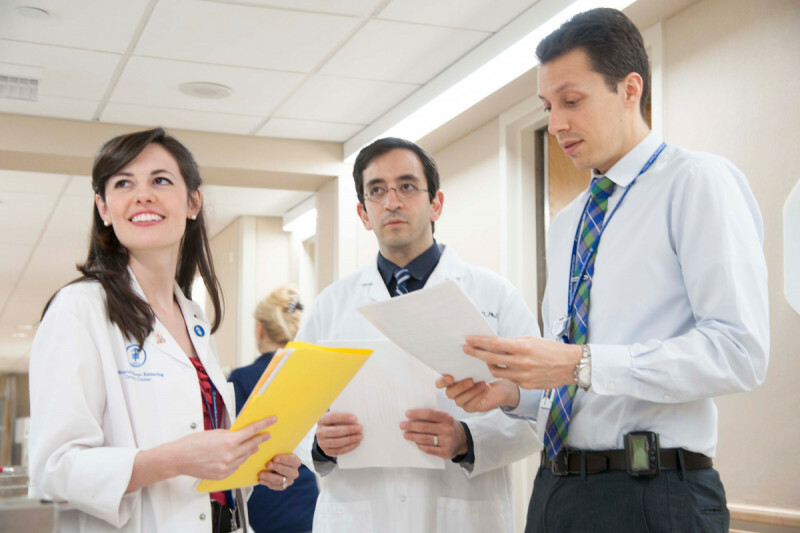 Welcome to Memorial Sloan Kettering Cancer Center’s radiation oncology residency program. With 22 residents and 23 faculty members at our Manhattan campus, we are one of the largest radiation oncology training programs in the country. Our residents come from diverse educational and personal backgrounds, bringing their unique strengths to our residency. Residents Sam Bakhoum, Erik Anderson, and Suchit Patel review the radiology on an inpatient case. Radiation oncologist Sean McBride (center) reviews patient notes with resident Sam Bakhoum, Erik Anderson, and Suchit Patel. 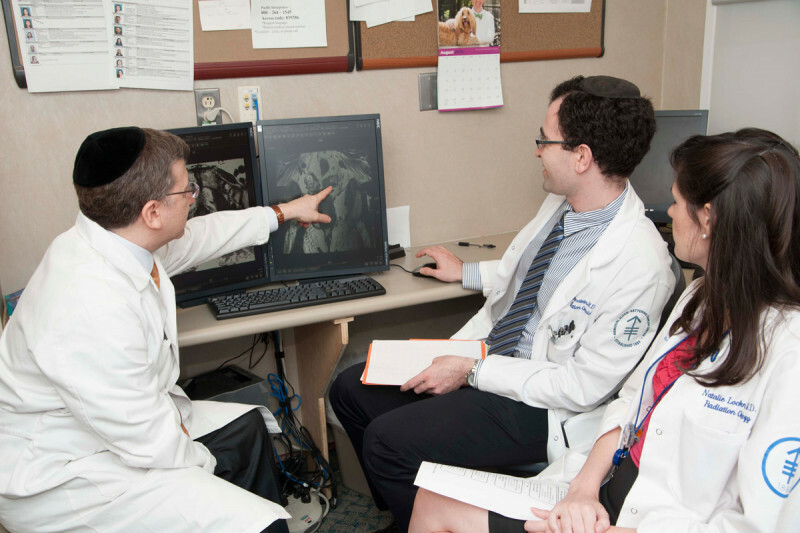 Radiation oncologist Michael Zelefsky (left) reviews a patient’s prostate MRI with residents Robert Samstein and Natalie Lockney. Residents Natalie Lockney, Sam Bakhoum, and Erik Anderson review patient notes. 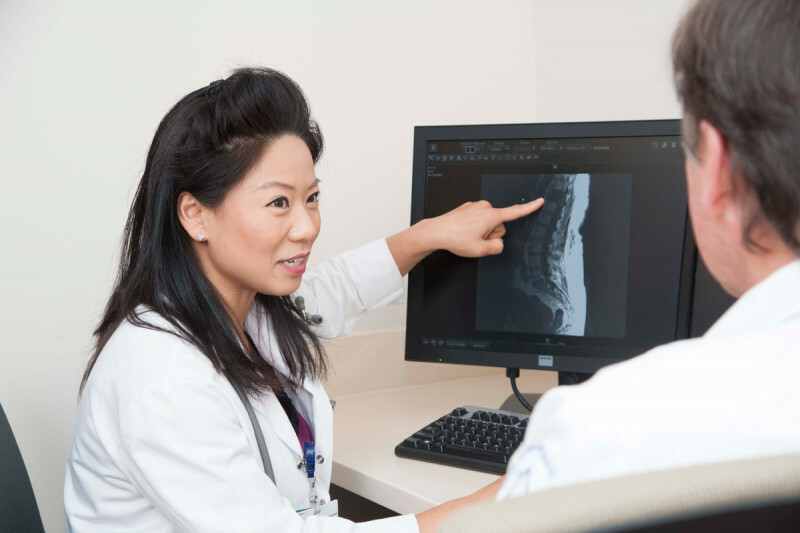 Resident Amy Xu presenting an patient’s MR spine to radiation oncologist Simon Powell. Attending physician Achy Yahalom leading a hands-on interactive teaching session for residents Joanna Yang, Sam Bakhoum, and Natalie Lockney in a treatment room. 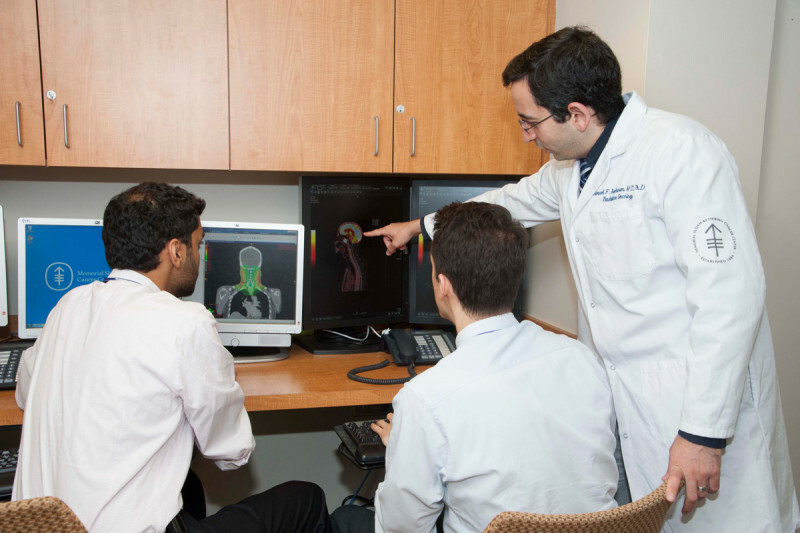 Throughout their four years of training, our residents work one-on-one with leaders in clinical radiation oncology, medical physics, translational research, and basic science. Residents become highly trained in modern radiotherapy techniques, including radiosurgery, image-guided radiotherapy, brachytherapy, and procedures such as intraoperative radiation therapy, total body irradiation, and total skin electron beam therapy. 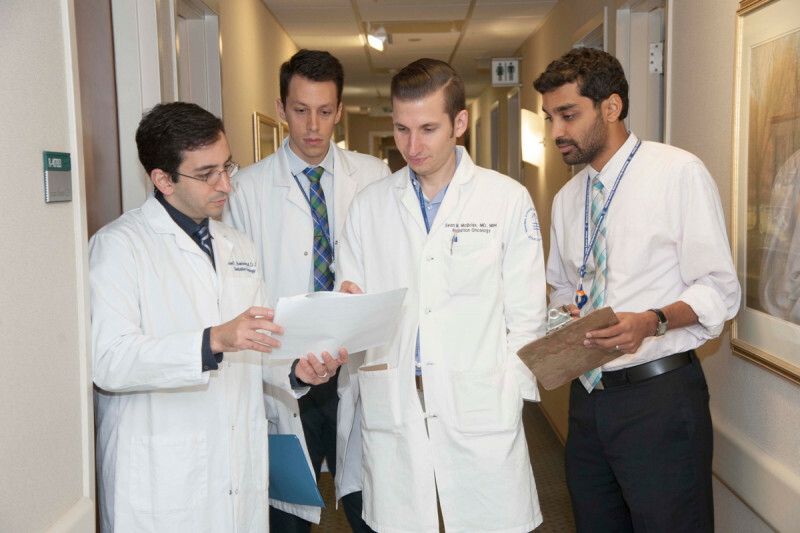 As part of training in a comprehensive cancer center, residents also routinely learn from experts in surgical oncology, medical oncology, and translational medicine. A dedicated year of protected research time provides residents an opportunity to participate in scholarly clinical and/or laboratory research. Our graduates leave this program well prepared to become leaders in radiation oncology. 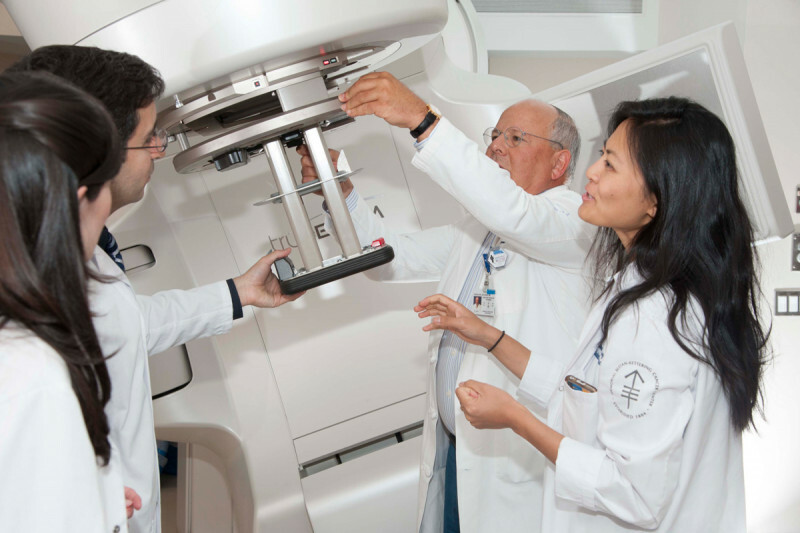 We train future leaders in radiation oncology by providing a collaborative, multidisciplinary clinical and academic experience at one of the world’s premier cancer centers. We seek to equip our graduates with the skills needed to diagnose and treat both common and rare oncological conditions; to become innovators in clinical, translational, and laboratory-based research; and to provide superior care to future patients.